Thanks for the great pics Kanta ! He was in a good mood, which is gratifying. Thanks for the great pics Kanta ! UNESCO’s Annual Goodwill Ambassador Meeting - 26 and 27 June 2013 @ UNESCO Headquarters, Paris. The Annual Meeting of UNESCO Goodwill Ambassadors @ UNESCO Headquarters, Paris - 26 and 27 June 2013. Fiona Commins, JMJ, Marianna Vardinogianni and Princess Firyal of Jordan. JMJ and the General Director of UNESCO, Irina Bokova. The "administrative monster" of the EU is blocking one of the keys to sustainable development, culture, by diminishing its importance in development aid, renowned musician and composer Jean Michel Jarre told EurActiv in an exclusive interview. In a wide-ranging interview (which can be found here) Jarre spoke at length about the symbiosis between his art and the protection of world heritage under Unesco, of which he is a goodwill ambassador. arre said that he was attracted to Unesco, the cultural arm of the United Nations, because it was the only international organisation capable of communicating mankind's problems of over the next 25-30 years. He gave as an example his interest in the destruction of the environment in the 1970s, represented by the cover of his 1976 album Oxygène, which shows the Earth peeling away to reveal a human skull. “We see that today everyone is conscious of the environment and is aware that better care should be taken of the planet for future generations. Even if everything is not perfect, we have succeeded. And I think the same is needed concerning education,” he said. Jarre paid tribute to Unesco Director General Irina Bokova who he said led the organisation by “making politics in the ancient Greek sense of this word”. He called her “one of the greatest intellectual leaders of the world” and praised the action of Unesco in fields such as education, gender equality, children rights, environment, water and culture. To Jarre, culture and the future of the planet are intimately entwined. “I think that culture is today more than ever key to sustainable development." But the musician criticised the European Union for its “Kafkaesque” administrative complexity, and regretted that culture was relegated to “second rank” in EU development aid. "Brussels suffers the nightmare of all the administrations of each of the country which adds itself to this city like a mille-feuille," he said. "It is clear that everyone is full of good intentions, but they gave birth to a monster, with the administrative system in Brussels. They wanted to control what must remain specific by definition." However, Jarre paid tribute to his own country, France, for having spearheaded the “cultural exception” in international trade talks (see background). This was not just a French concern, he said, but an international one, as it created the idea that culture everywhere should be “considered in an exceptional manner”. “One has to understand once and for all that culture is one of the foundations of democracy, one of the pillars of freedom, of one's identity. And in defending our culture, we defend the culture of others. And when France says "attention, the cultural exception exists," it doesn’t mean that the French cultural exception should be given special treatment,” he said. Jarre also said that the European Union had a role to play in promoting culture worldwide, because the old continent “ was and still is ahead in those questions”. “In how to respect culture and in how culture is one of the pillars of our societies, it is Europe that has always been at the forefront of this process, and that has to continue, with the Chinese, with Asia, with the United States, and also to have this discussion between the North and South," he said. Jarre gave thanks for the support he had received as a young musician in Eastern Europe, well before the fall of the Berlin wall, where his music was seen as a symbol of freedom. “This gave from the very beginning an additional meaning to my work of artist and musician. From the very beginning, I developed personal relations with a number of countries, with Bulgaria, which was one of the first countries from where I received letters of encouragement. Paradoxically, as many as from my own country. This is something that deeply impacted on me, which became part of my DNA,” he said. Jarre, a pioneer of electronic music known for enormous outdoor concerts, has for many years promoted the world's cultural heritage by performing at locations such as the pyramids in Egypt or the Morrocan Sahara. The Frenchman was the first Western musician invited to perform in China, gained considerable Eastern Europe extensively and has broken the Guinness World Record for the largest concert three times (in 1979, 1990 and 1997). He is also the author of a fundraising initiative to combat illiteracy. Culture today is more than ever a key to sustainable development, says Jean-Michel Jarre, who is goodwill ambassador of UNESCO. The musician regrets that "the administrative monster" of Europe culture relegates to the background. He paid tribute to France to promote "cultural exception" on a universal scale. Hello Jean-Michel Jarre. Needs no introduction to you. Two words for me, I just Eastern Europe and many of my contemporaries the Beatles, Pink Floyd, Jean Michel Jarre has changed our lives. You accelerated the fall of the Berlin Wall. Are you aware? I was conscious afterwards. Because when we do things we do not realize that by definition of the impact they may have. It is true that, from the beginning of my work, I've had letters that came from Eastern Europe, the countries of the East who experienced the Soviet dictatorship, letters that have affected me much and encouraged. That is to say that my music was perceived from the outset as a symbol of escape, freedom, banned in countries on the other side of the wall, especially in Russia, Soviet Union. This gave extra meaning to my work as designer and musician. And from the outset, I have developed personal relationships with a number of countries, with Bulgaria, which was one of the first countries where people have sent me letters of encouragement. Paradoxically, as well as in my own country. This is something that has obviously touched me, part of my DNA somehow. You even move further east, I think of China, you have done concerts in developing countries, I think the concert at the Pyramids of Egypt, what attracts you to these places , is to showcase the cultural heritage of humanity? Several things. The music I make, electronic music, when I started, was not as popular today. And the issue was quickly asked: how to stage, how to play, how to interpret it? I've always been quite involved in the ecology and importance of the environment, and it seemed interesting to link the music to the spaces and places. And also to the time of night, like the travelers, set up his tent and disappear the next. For me it has always been this traveling and poetic side of travel with its mystery, as with his hand strength. This is not a paradox: the ephemeral is what remains most in your heart. It is also the kind of things I wanted to share with the public: be in tune with their environment, coming toward them. This is what also brought me closer to UNESCO and the importance that UNESCO had, has and will in fact clearly identify a number of places in the world that are part of our memory collective, global, our identity as earthlings, beyond borders, it must not only maintain, but to live. And me as a creator, what interested me not to consider these places as dead stones or have a museum approach places on which a cheese is put, because all these places been built at the time that society benefits in one way or another:, religious or civil societal, whatever. And so suddenly, it's something that I wanted to celebrate. And then the music, not the song, is by definition a language that is universal. And so I found myself with invitations, this was not necessarily the projects I had in mind, from cities and countries that offer me to concerts in a few special places, which of course are always human adventures. They are artistic adventures, but they are also human adventures, whether in China, Egypt, Africa, America, Russia, the Eastern too, where I have very strong links with Bulgaria, Poland, Czech Republic, Hungary - these are countries that rely heavily for me. It's been 20 years that you are a goodwill ambassador of UNESCO. This is apparently a work that has brought you a lot? I am always suspicious of artists who jump on causes, and often it is something ambiguous, because I do not think it is the role of artists to transform their political platform scene. I think these are two different professions. However, I think that from the moment you have a contact to the public, we have a responsibility, and there is a number of things that can transmit through his creation. What I was immediately attracted to UNESCO when the Director General Federico Mayor then asked me to be UN ambassador for UNESCO, is that this is the only organization which is non-political and able to think about the problems that will arise in 25-30 years, that is to say, to think about the medium term and long term. And this in a world where it is reflected in the very short term. This is true for policies that are caught in the elections for the bosses of big companies that are in the budget deadlines, while UNESCO has the power to consider the problems of humanity objectively. This is something that I liked and I decided to devote myself, to devote part of my time, and just to support the values of UNESCO, the UNESCO campaigns in my daily life. That is to say that whenever I have the opportunity to talk, to promote the ideas of UNESCO, to raise awareness as UNESCO has a somewhat abstract image for street people. As I was early involved in environmental issues, one of my first album called Oxygen  and it was not much at the time to get involved, to become interested in the environment. We see that today we got that everyone is aware of the environment and the fact that it is better to pay attention to the planet for future generations. Even if everything is not perfect, we did it. And I think it's the same thing with regard to education. Today, education is a priority as the ecology has been there thirty years. I would say that three important things for the future, to paraphrase Irina Bokova, our CEO, is education, education and education. But the world is he better now? Will it still has a skull out of the earth's crust, as on the cover of Oxygen your disc? It is latent. What I like in this painting by Michel Granger, this is an image that is not necessarily pessimistic. It is rather a question: where do we do? This is the problem that is exacerbated by one of the taboos of our society, which is the demographic problem. It is through education that we come to understand natural disasters, to reduce religious extremism, and to better control the population, which is something we do not talk enough in my opinion. All these issues are causes dear to UNESCO, which have priority, I would say even more, which are essential, and that is why I am extremely pleased that today the CEO at the head of the UNESCO is a woman. And such a woman Irina Bokova that I, for lots of reasons embodies what must be one of the great intellectual leaders of this world. That is to say, of doing politics in the Greek sense of the term, thinking about the future of the company, the future of our children and future generations. And also because it is Bulgarian. This is something that is interesting for me too. Why? Because all the countries of the East have known almost a century of pain, suffering century. But we know that what does not kill you makes you stronger. And I am always struck by the wisdom of Eastern Europe, beyond Bulgaria, all countries of the East. The Eastern rightly I might almost say a mediator role in the intellectual, precisely because of what happened in the twentieth century, to be some kind of connection, almost on the level of affect, between East and West, and between the North and the South. And I think that it is a woman, the only woman who is at the head of UN organizations, is something essential. And I think Irina Bokova is totally in tune with the way we will have deal with the problem of education, the issue of equality and the treatment of women, children, of course, the problem of ecology, water problem, culture too. And that brings us to the role of the European Union in relation to culture. I think the culture today is more than ever a key to sustainable development. And, beyond culture, the concept of intellectual property. That is to say, the famous concept of the cultural exception is extremely discussed in Europe today, and that Mr. Barroso took position [in the negotiations for the Transatlantic Partnership on Trade and investment]. We see that this is a very shaken by the whole evolution of the Internet connection, etc.. Do not forget one thing is that intellectual property is one of the foundations of democracy and the rights of creators to make a living from their work is something that concerns everyone. In every family there are children, brothers and sisters who want to be filmmakers, musicians, photographers, artisans, architects, etc.. Their creation is the identity of the future. It's been like that since humans are on this planet. So this is not just a problem of copyright, it is not a financial problem - who will win money. This is much broader than that. It is also the survival of some developing countries. That is to say people who are plundering the wealth today in the world of advertising, fashion, often without knowing it, without recompense to the communities in need. And I think Europe has a role to play, because it was and still is ahead of those questions. How to respect the culture and how that culture is one of the pillars of our societies, it is Europe that has always been at the forefront of this process, and it has to continue. With the Chinese, with Asia, with the United States, and also have this discussion between North and South. And UNESCO, of course, is at the center of these discussions. And when we talk so much parity, it is time also to apply to the head of various organizations. That is why the presence of Irina Bokova at the head of UNESCO is so essential today. The European Union is not it too compartmentalized in its division of labor, because the Development Commissioner is not responsible for the cultural dimension? I am deeply European, but Europe is not Brussels. I would say by this that Brussels suffers nightmares utility of each country in addition to the city as a mille-feuille. We suffer, each too much administrative complexity. And Brussels is the administrative complexities countries added together. So it's totally Kafkaesque. With people of good will who do not understand them, which paralyze each other, and that European decisions are a muddle of vacillations and often footholds in the carpet. Nevertheless Europe advance, but it does not advance at all to the speed at which it should move forward. And it is clear that everyone is full of good intentions, but it gave birth to a monster, with the administrative system in Brussels. We wanted to control what must remain specific by definition. This shows the extreme in European countries so caricatured because it is obvious that it is not the solution. Obviously that culture is at the center of it all. Culture, by definition, is the specificity of each. It's yours, it's mine, it's one of our children is that of our parents. And we can not apply the same principles and approach culture as we approach the agriculture, industry or any other sector of society. And, hence, culture is secondary. Because it is not in the DNA of political culture to the foreground. This has never been. It has often been in growing companies, so it is a bad sign for us. The more we bring culture into the background, the more we will decline. While paying tribute to my country, France, which so clumsy sometimes, which is not the case right now, but has been in our history, I must say, it has highlighted the culture so flamboyant and so visible. There are many things that might work better in France, but I support our position vis-à-vis culture, that is to say, to make culture an exception, not a French cultural exception, but be in the company culture is unique and should be considered in exceptional circumstances. You must understand once and for all that the culture is one of the foundations of democracy, one of the pillars of freedom, one's identity. And in defending our culture, we defend the culture of others. And when France says "attention, cultural exception exists," it is not the French cultural exception which must be considered separately. Distribute books, movies and music, it's not like yogurt distribute or endive. Although the problem of endives and yoghurt also a problem even in Brussels. Where is the music? Besides, I'm not sure if the vinyl does not have a better sound quality than MP3 or CD. You who invented musical instruments ought to know? Indeed there is a paradox that is born at the advent of the CD, which is that the vinyl had flaws, but was a very good quality. We were introduced to the CD as the Holy Grail of the product and sound reproduction that would be ideal, but we realized that this was not the case, it was rather the 78 digital, and c 'was worse than vinyl. Then came the MP3, which was worse than the CD. So there has been a regression in each other's way, which eventually changed the ear, good or bad does not matter, but it has changed. And at the same time from a technological point of view, recording studios, for movies it's the same thing, have evolved. There is a lag between increasingly important quality a player can have in a studio and how his music will be heard. But it will be balanced. The music of the future will necessarily go through a great upheaval in the way of listening. Today we are in the digital age, as at the time of the last century, when listening to a gramophone. With MP3, we are in a situation of digital Gramophone. The 21st century, I hope and I believe, will allow to explore more subtle and relevant ways to appreciate the sound and the picture in general. As to the music itself? And instruments as extraordinary as the laser harp? Course. I think the violin will change considerably. We already see with what is happening with tablets, we can do now in the Thalys, when we go from Paris to Brussels. This new violin-related digital access will facilitate the creation for everyone. I think the democratization of tools will also enable the democratization of creation. What makes you want? Making music in space? There are a few years Arthur Clark, the author of 2001 - A Space Odyssey, with which I was very friend, told me, "thou there need you to do a concert on the moon one day" . I replied: "Arthur, this is not serious, on the moon there is no atmosphere, the sound can not be broadcast. "He said:" No, but you find a way, I know it will happen one day. " By Georgi Gotev who is senior editor of EurActiv. Back in 1976, I took a deep breath of Oxygen. Many of my friends did the same. In 1989 the world changed. No, I was not a dissident; I was not a hero, just a normal person seeking refuge in music. His music conveyed the message of freedom. On 25 September 2013 in a Paris bar I met Jean Michel Jarre. I told him I had two passions: politics and music We talked about both. This is the transcript in French and a full-size 31 minutes unedited video. speaking of UNESCO, JMJ mentioned he's doing a concert in China next year for UNESCO...start saving up!! Culture is our future: we must protect it! Honorary and Goodwill Ambassadors of the United Nations Educational, Scientific and Cultural Organization, whilst gathered in Paris on 30 June and 1 July 2014 on the occasion of their annual meeting, have launched an appeal to protect culture considered as a driver of development and as a source of dialogue. We appeal that the Post-2015 international development agenda clearly incorporates the role of culture and of cultural diversity as accelerators and facilitators of sustainable development, fully recognizing culture as our common source of creativity, innovation and renewal, whereby humanity is constantly reinventing, develop and build a better future. 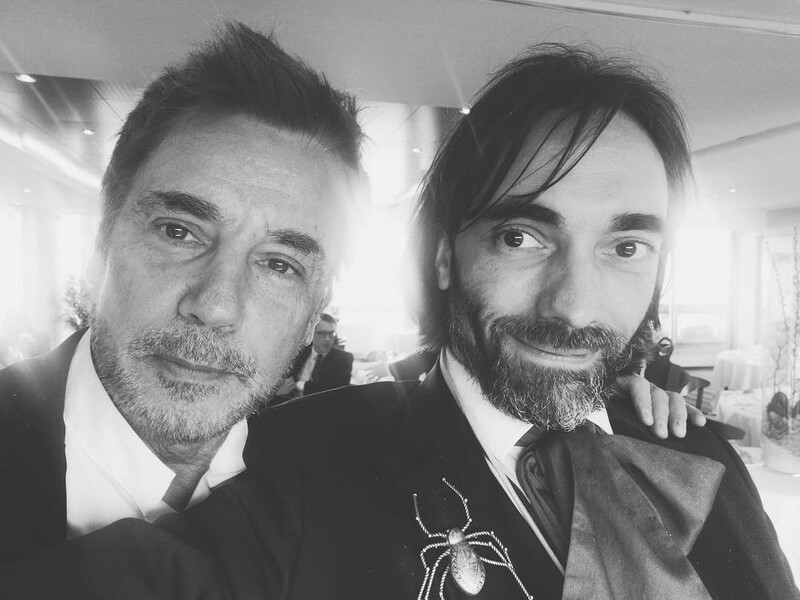 Jean Michel Jarre and Chico Bouchikhi - http://en.wikipedia.org/wiki/Chico_Bouchikhi - The Annual Meeting of Goodwill Ambassadors of UNESCO held in Paris this year (2014) with the participation of prominent personalities from around the world, including the dynamic Greek Ambassador Marianna B Vardinogiannis. The Australian Ambassador to Greece Jenny Bloomfield became donor bone marrow, supporting the "Vision of Hope", and so did the National Olympic Academy of Greece visited the Pediatric Oncology Unit. 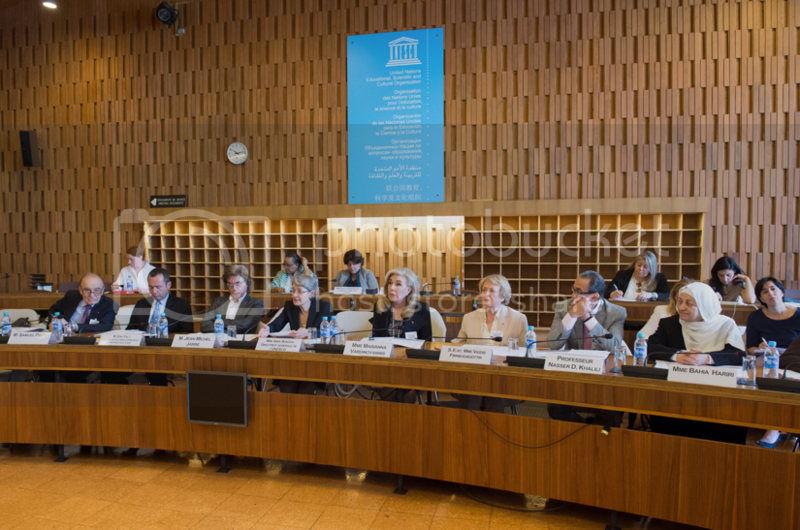 This year’s Annual Meeting of UNESCO Honorary and Goodwill Ambassadors, convened by the Director-General, Irina Bokova, took place at UNESCO Headquarters on 15 June, and brought together outstanding personalities from the worlds of art, film, music, literature, charity and public affairs. The Honorary and Goodwill Ambassadors such as Her Royal Highness Grand Duchess Maria Teresa of Luxembourg, Her Royal Highness Princess Firyal of Jordan, Mrs. Ivonne A-Baki, Mr. Metin Arditi, Mr. Pierre Bergé, Mrs. Claudia Cardinale, Ms. Cecile Guidote-Alvarez, Mrs. Bahia Hariri, Mr. Alain Husson-Dumoutier, Mr. Jean Michel Jarre, Mr. Cyprien Katsaris, Countess Setsuko Klossowska de Rola, Mr. Jean Malaurie, Mr. Serguei Markarov, Mrs. Mariana Nicolesco, Mr. Eijin Nimura, Mr. Ali Mahdi Nouri, Mr. Jordi Savall, Mr. Zurab Tsereteli, Mrs. Marianna Vardinoyannis, and many others joined this important gathering. In this very special year celebrating the 70th anniversary of UNESCO, the main topics of discussion were focused on actions such as the World Education Forum 2015, UNESCO’s thought on the issues related to youth and Internet, the "UNITE4HERITAGE" campaign, as well as UNESCO’s participation at the Conference of the Parties to the United Nations Framework Convention on Climate Change (COP21/CMP11) to be held in Paris from 30 November to 11 December 2015. The Goodwill Ambassadors also presented their work over the past year and discussed their experiences. Another highlight of this year’s meeting was the performance by the troupe “Al Buggaa”, directed by Mr. Ali Mahdi Nouri, UNESCO Artist for Peace. The UNESCO Goodwill Ambassadors are an outstanding group of celebrity advocates who have generously accepted to use their talent and status to help focus the world's attention on the Organization’s mission. They extend and amplify UNESCO's work in its fields of education, culture, science, communication and information. I recognise our Star and also the lady with the orange hair! You are welcome, Harjinder. Yes, JM's left, right hand person and more. "I thank Jean-Michel Jarre, for using his outstanding artistic talents to advance UNESCO’s key messages of peace and dialogue, reaching out to young people - which is so important today." Cyprien’s speech for Peace on the occasion of the Annual Meeting of UNESCO Honorary and Goodwill Ambassadors at UNESCO Headquarters in Paris, 15 June 2015. The meeting was chaired by the UNESCO Director-General, Mrs. Irina Bokova and moderated by Her Royal Highness Princess Firyal and Mr. Jean-Michel Jarre. In these times JmJs bringing cultures together since 1981 is so necessary so significant. JmJ is one of the most important hope on Earth we have for bridging cultures. JmJ is World Ambassador for Togethernes. Yes, I mostly agree I`m glad we have personalities like him !!! On 20 April, the Director-General of UNESCO, Ms Irina Bokova received UNESCO Honorary and Goodwill Ambassadors on the occasion of the Annual Meeting 2017. The main objective of this meeting was to examine the priority activities of the Organization for months to come and to discuss the best way these personalities could contribute to the realization of these activities. The Annual Meeting was also an occasion to share the details of the various projects and activities that the Honorary and Goodwill Ambassadors have implemented in their respective domains since the last Annual Meeting in May 2017. The journey of 20 April 2017 was focused on the presentations of the World Humanities Conference, UNESCO’s actions for Youth, as well as the high-level United Nations Conference on Ocean. Following the Director-General’s opening speech, the World Humanities Conference was presented by Professor Jean Winand, Dean of the Faculty of Philosophy and Letters of the University of Liège, Co-chair of the International Programme Committee, Professor Luiz Oosterbeek, Secretary-General of the International Council for Philosophy and Human Sciences (CIPSH), and Ms Nada Al-Nashif, Assistant Director-General for Social and Human Sciences. The World Humanities Conference will gather participants from all over the world working in the fields of science, politics, art and communication. The talks will focus on the six following main themes: Humans and the environment; Cultural identities, cultural diversity and intercultural relations; Cultural heritage; Boundaries and migrations; History, memory and politics; The humanities in a world in transition. During the afternoon session, the Honorary and Goodwill Ambassadors were informed about UNESCO’s various activities for Youth. During this presentation, Ms Nada Al-Nashif has recalled her field visit to Uganda in February last, accompanied by Forest Whitaker, UNESCO Special Envoy for Peace and Reconciliation. While emphasizing the importance of the projects that Forest Whitaker is implementing in Uganda and in South Sudan to support young people, Nada El-Nashif encouraged other UNESCO Honorary and Goodwill Ambassadors to bring their support to the Organization’s actions related to Youth. She also recalled the support that Metin Arditi, Special Envoy for Intercultural Dialogue and Eijin Nimura, UNESCO Artist for Peace bring to the Organization in this crucial area. The high-level United Nations Conference on Ocean and on Implementation of Sustainable Development Goal 14, which will be at United Nations Headquarters in New York from 5 to 9 June 2017, was also presented to Honorary and Goodwill Ambassadors. This Conference, aiming to be the game changer that will reverse the decline in the health of our oceans, will also be solutions-focused with engagement from all. The Honorary and Goodwill Ambassadors such as Mrs Marianna Vardinoyannis, Mr Serge and Ms Beate Klarsfeld, Mr Jean-Michel Jarre, Mrs Bahia Hariri, Mr Marc Ladreit de Lacharrière, Lady Cristina Owen-Jones, Mr Metin Arditi, Countess Setsuko Klossowska de Rola, Professor Jean Malaurie, Mrs Vera Michalski-Hoffmann, Mr Seidnaly Sidahmed Alphadi, Mrs Maha El-Khalil Chalabi, Mr Kudsi Ergüner, Mrs Zarifa Mgoyan, Mr Zurab Tsereteli, Mrs Marianna Nicolesco, Mr Herman Makarenko, Mrs Cecile Guidote-Alvarez and many others participated at this meeting. 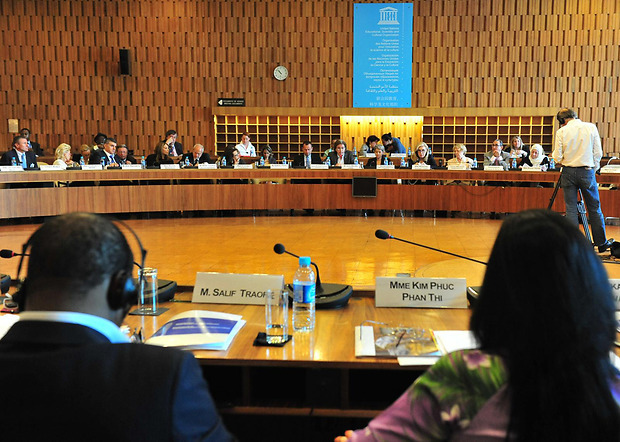 The annual meeting of the Intergovernmental Committee to Implement the 2005 Convention on the Protection and Promotion of the Diversity of Cultural Expressions will be held at UNESCO Headquarters from 11 to 14 December. The 12th session, which will be opened by UNESCO Director-General Audrey Azoulay, will include a new series of public conferences entitled Create | 2030. Their purpose: to show that investing in creativity can contribute directly to achieving the goals of the 2030 Agenda for Sustainable Development. 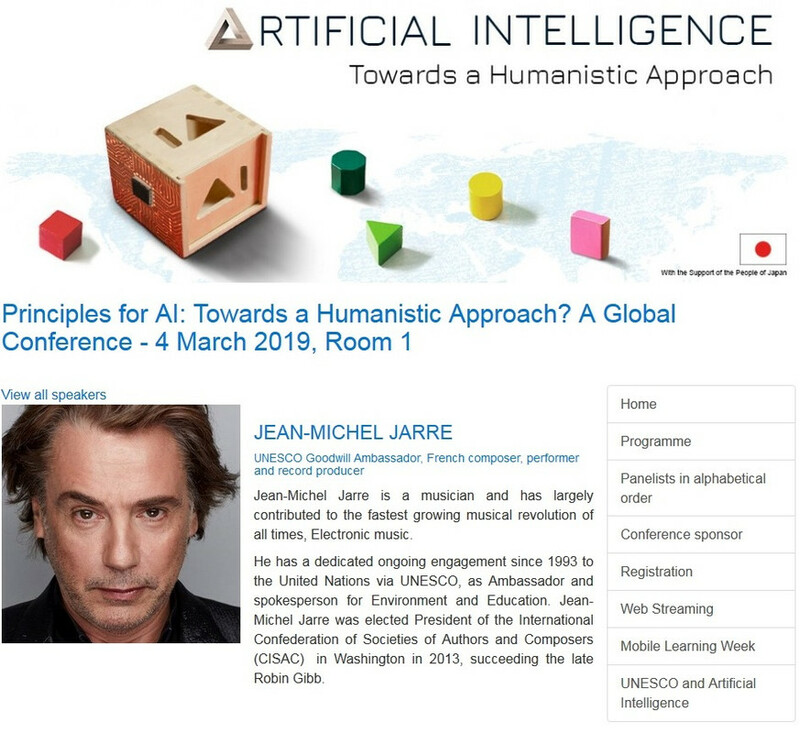 Among the artists who will speak during these discussions, UNESCO Goodwill Ambassadors Jean-Michel Jarre and Deeyah Khan will discuss the impact of artificial intelligence on creativity and artistic freedom. Academics, policymakers and entrepreneurs from around the world will also address these issues during the meeting. At UNESCO in Paris, CISAC President Jean-Michel Jarre opens a discussion on artificial intelligence within the creative sphere. "We have to distinguish intelligence and consciousness."